On a nice morning, it’s always a pleasure to go for a walk in our neighborhood. Tian Mu is an area full of cafes, restaurants and other entertainment choices. Some of these are completely unexpected, such as Mr. Li’s streetside art gallery. On a recent Wednesday afternoon, I was walking home and had reached the traffic circle at Tian Mu Road and Zhongshan North Road. 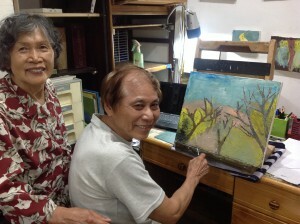 In front of a convenience store, I saw a group of paintings on the sidewalk, being attended by an elderly lady, Mrs. Li. My eyes were drawn to the paintings. They were amazing. I couldn’t take my eyes off them. 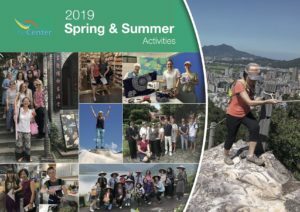 They had the power to transport me to the places they showed, from Yangmingshan to a Japanese park. I was truly impressed. The next day, I returned, armed with a camera, a notebook, and a pencil. I met Mrs. Li again, but was not the only viewer. Mr. Samuel Liu was examining the paintings and speaking with Mrs. Li, seeking information about the painter and the paintings. Mr. Liu and Mrs. Li agreed to pose for some photos in front of the paintings. After the photos, Mr. Liu acted as my translator, helping me get the address and phone number for Mr. Li, the extraordinary artist who had painted the pictures before us on the sidewalk. Later the same day, Mr. Li, the artist, welcomed me to his home. The walls were covered in paintings, top to bottom and left to right, all Mr. Li’s. Mr. Li, with tears in his eyes, spoke like a poet, introducing his paintings and a large album of photos of his other work. 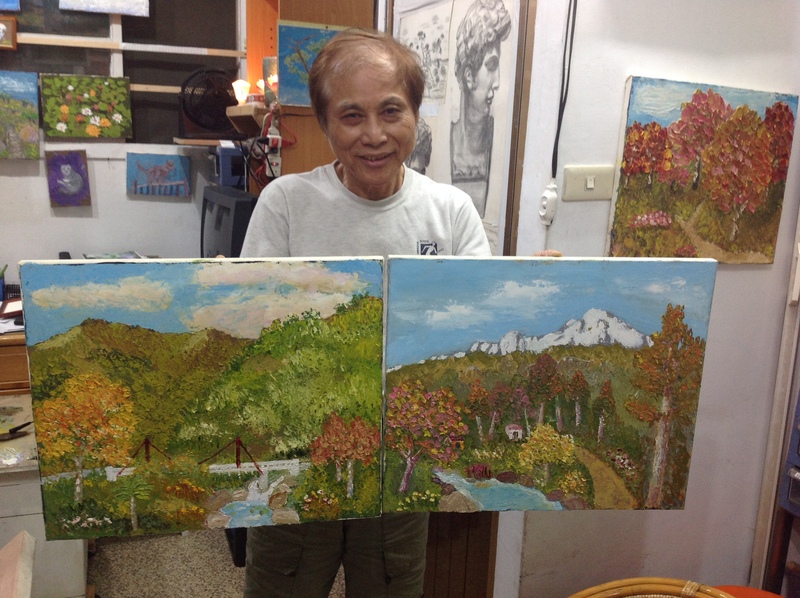 Mr. Li told me that he had started painting about fifteen years before, when he had retired. 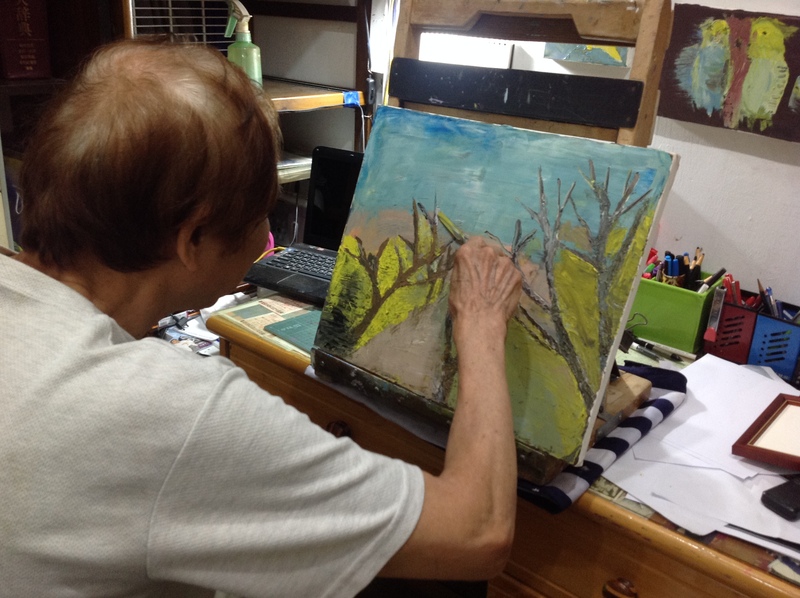 His daughter had introduced him to drawing and painting and he had taken up the brush as a challenge. Ever since, he has been painting historical scenes, people and landscapes. Whenever something registers on his emotions, he picks up his brush to share with everyone. I enjoyed all the paintings. Naturally, I had a favorite. It is a painting of two women walking in a Japanese park. 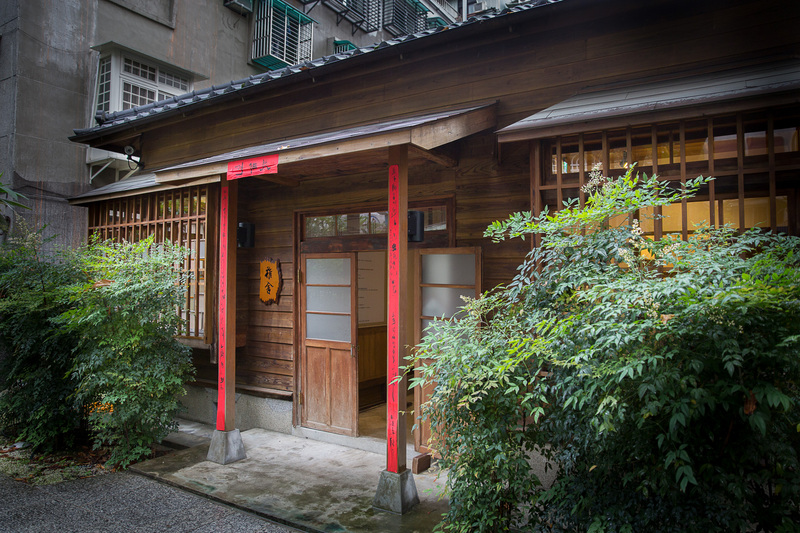 They are well dressed in Yukata, wearing flip-flops, speaking and laughing as they walk, carrying a yellow umbrella. This is a very pleasant painting. Another painting touched me profoundly. It shows a train rounding a mountain. The image carried me back to my first days in Taiwan. Our family had gone to Fulong beach by train. The mountain was on our left the whole way. Mr. Li said that the train painting was a product of his imagination, not observation. Apparently, Mr. Li’s imagination is connected to my history. 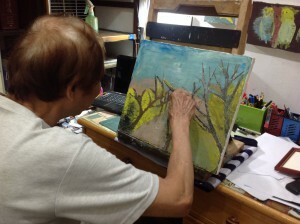 Mr. li intends to continue painting. Having reached the age of eightyone painting is like home and it has given him many wonderful memories. Just as Mr. Li has received many fine moments from his painting, Mr. Li’s paintings and stories have given me many happy memories. Above all, what Mr. Li has gifted me with is the injunction that one should always stay busy and do the work with passion.